Responding to the call of the mountains we set off to the Garhwal Range of Uttranchal. We boarded the Karnataka Express from Bangalore on 27th August 2001 and reached New Delhi around 1.00 pm on 29th August 2001. From Delhi we hired a Tata Sumo to Haridwar, left New Delhi by 3-00 pm, when we are on the way to Roorke, trouble broke out near Manglaur for a inclusion of Haridwar to Uttar Pradesh, as it was been in Uttranchal State, Curfew was imposed in Manglaur, we were forced to stay on the midway, we could not travel, we halted in a Dhaba, then at early morning wee hours at 3-30 am we left towards Haridwar, some one informed us to go by this time or else you could not travel because of Rasta Roko and the road were closed. We left Midway Dhaba and reached Haridwar at 4-30 am. 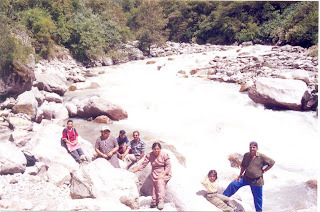 Next day we visited in and around Haridwar and booked tickets (GMOU Limited) to Govindghat. Next day morning at 4-30 am left Haridwar towards Govindghat, we had our breakfast at Deoprayag and at 4-00 reached Joshimath the gates were closed after half an hour the gates were opened we reached Govindghat by 6-00 pm, and we stayed at Gurudwara. We had a Darshan and had dinner in Gurudwara. Forward of this point, mobility is provided by Mule-power, Pony and Dolly, those who cannot handle the walking. Next day early morning we started our Trek to Ghangria by 6-00 am after having a Tea, the trek was very steep and painful. Food at the local restaurant in any form feels divine going down. The synchronized singing of the spectacular array of birds which we saw more often Himalayan Green Pigeon and Water falls is a treat to the ears at dawn. The cobble stone path out of Ghangria splits about four hundred meters from the village. we reached Ghangria by 4-30 pm. we stayed in a Private Hotel. The Lokpal Lake, also known as Hemkund lies at an altitude of 4329 mts. in heavenly environs. A steep trek from Ghanghria leads one to this breathtaking spot in about six to seven hours. Next day we planned to trek to Hemkund Sahib, we started our trek at 5-00 am in the morning, it was a very steep climbing towards Hemkund, all the way there was little problem with the Mules, which is also carrying piligrimagers to Hemkund, on the way we found Brahna Kamal flower and at around 12-30 we reached Hemkund, we had bath in the lake, and had a darshan and prasadam. We met on the way a Sikh piligrimage and we came to know about the facts of Hemkund. They narrated as , It is an important pilgrimage for all but especially Hindus and Sikhs. There is a Sikh Gurudwara and a Lakshman temple built on the banks of the lake. Encircled by seven snow clad peaks and their associated glaciers, the reflection of these peaks in the crystal clear serene waters of the lake is mind blowing, and picture postcard perfect. The glaciers from Hathi Parvat and Saptrishi peaks feed the lake and a small stream called Himganga flows out of this lake. As alluded to in the holy Granth Sahib, Guru Govind Singh, the tenth Guru had meditated on the banks of this lake in one of his earlier births. It is widely believed among Sikhs that Guru Govind Singh introduced the features now universally associated with Sikhism. On 15th April 1699, he started the new brotherhood called the Khalsa (meaning 'the pure', from the Persian word 'Khales') - an inner core of the faithful, accepted by baptism (amrit). The 'five k' s' date from this period: kesh (uncut hair), kangha (comb), kirpan (dagger or short sword), kara (steel bangle) and kachh (boxer shorts). The most important is the uncut hair, adopted before the other four. The comb is sometimes designated specially as wooden. The dagger and the shorts reflect military influence, while the bangle may be a form of a charm. Legend has it that Lakshman, the younger brother of Ram, meditated by the lake and regained his health after being severely wounded by Meghnath, son of the demon Ravana, during battle. 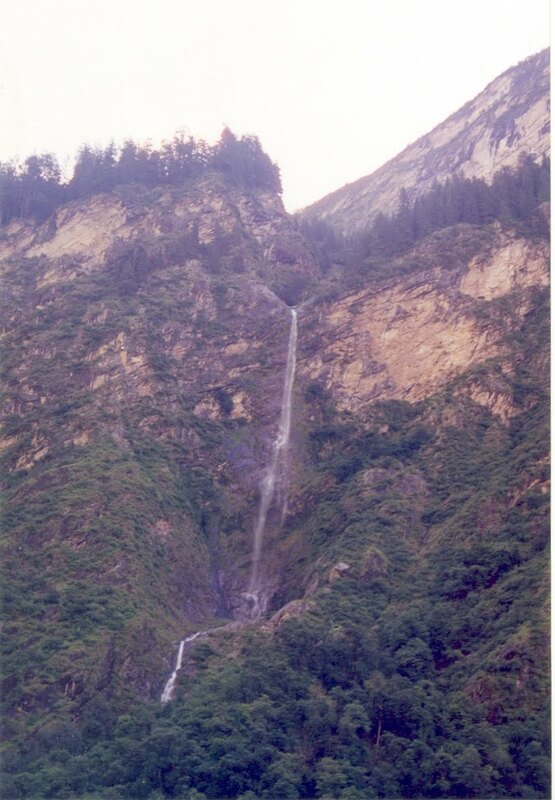 Despite its ancient connections, Hemkund/ Lokpal was 'discovered' by a Sikh Havaldar, Solan Singh, and became a major pilgrimage centre only after 1930. We had a few photographs of our group and also had a panoramic view of snow capped mountain (not so much) of Saptharshi Peak and Hathi Parbats. We left Hemkund at 2-00 pm reached Ghangria by 6-30 pm. We had dinner in our hotel where we stayed. All are very tired they got to bed early as the whole night heavy rains lashed out. Next day morning we started our trek to Valley of Flowers, A little further up is the toll-gate where you pay to enter the valley. A separate charge is levied for Indian citizens and foreign Nationals, the former paying a lot less, we paid our Entrance fee to enter the Valley as it was a National Park, we met the RFO, and he guided us how to enter the Valley and do’s and don’t’s of Valley, and also he informed us not to throw any choclate wrappers of throw away any plastic water bottles. 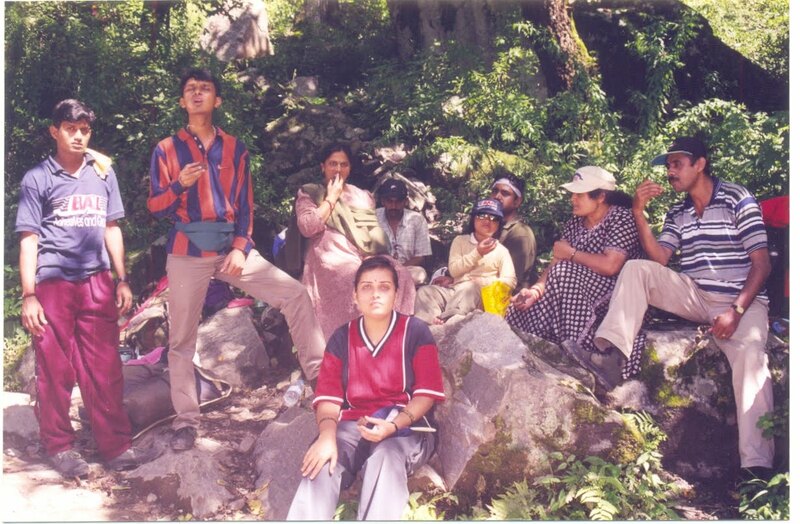 we assured him we are all the eco-friendly trekkers group, we knew what happens if we spoil the nature. The valley itself is at least a couple of kilometers wide and ten kilometers long. It is impossible to do it all in a day, yet one can get a fair idea of the flora in this region. The flowers in the valley are amazing. Of course, you cannot see all the four hundred odd varieties that are said to grow here, as different varieties are spaced out between the growing season. We find the famous resident of the Valley of Flowers is undoubtedly the Cobra Lily. Seen here in the two varieties. Named for obvious reasons, the lily is quite common throughout the valley, yet a good specimen is difficult to find. The conditions in the valley where rain is an everyday occurrence and the fog brings even more moisture, makes for ideal growing conditions for the Cobra Lily and other vegetation in the region. Thanks to the preservation efforts of the government and its efforts in preserving the flora of this region, specimens such as those seen here might just be able to thrive, so that future generations may enjoy them. However, these efforts have also meant trouble in the valley, overgrowth of a common weed Polygonum which has taken over most of the valley. Without a coherent policy from the government, this knee-jerk reaction of not allowing graziers in it, could have been beneficial to the 'content' of this valley. The Himalayan Blue Poppy is unique to this region. It is beautiful to look at and against the back drop of rocks it stands out. It also has a bad habit of growing in places difficult to get at and makes it a challenge to photograph. Some folk have been lucky to find a specimen within easy reach. Most of the time however, you have to risk life or limb to get a specimen in good view. For those interested, this flower has enhanced the flavor of the Perfume POEMA. This valley is an enchanting place and many folk venture to come and look at its splendour. Over the years the paths have been damaged due to erosion and even though the Government has taken the necessary steps to quell the decay, things are not as good as they could be. However, a serious problem as a result of the drastic measures taken, has been the prolific growth of common weeds like the Polygonum - a tall plant with pink flowers, and yellow flowers which would have otherwise been eaten by grazing animals, now banned from the valley. We had some panoramic view of the valley, and had a few photographs, we had light refreshments and we left valley at 2-30 pm, as we were at the Entrance of the Valley, heavy rain lashed for nearly one and half hours, we stayed in RFO hut and met two Sikh pilgrimage who are on the way to Valley, finally we reached Ghangria by 6-30 pm, had tea, we rested for and made a phone calls and had a dinner and took rest. Next day we started trek at 6-00 am back to Govind ghat, we had tea and breakfast at Bhyunder and a nimbu panni (Lime Water) at Pulna, we reached Govindghat at 3-30 pm. we left towards Badrinath, heavy rains started as we stayed nearby bus stand. We proceeded towards badrinath and reached by 6-30 pm, we halted at Anantha Mutt, Badrinath. We trekked back down from Ghangria to Govindghat and took a bus to Badrinath. Again the way was blocked by landslides near the village of Ram Bagri. In these areas, the roads are maintained by the Border Roads division of the Indian Army. It was amazing to see the conditions under which these brave army jawans of India worked to keep these routes clear, a crucial task in such a remote region. We saw army workers operating bulldozers under the ever-present threat of being buried by further landslides. On the return journey from Badrinath, I was amazed to see that the road, although not completely repaired, was fully passableNext after having a darshan at Badrinath, at 1-30 am we left to Mana, the Last Indian Village from there we visited Bhimthal, we trekked to Vasudhara Falls all the way the weather was very cloudy and some time it was a bright sunshine, when we reached Vasudhara Falls at 3-30 pm it was a very pleasant took some photographs and then came back to Mana from there to Badrinath. For the last leg of the journey, We trekked back down from Ghangria to Govindghat and took a bus to Badrinath. Again the way was blocked by landslides near the village of Ram Bagri. In these areas, the roads are maintained by the Border Roads division of the Indian Army. It was amazing to see the conditions under which these brave army jawans of India worked to keep these routes clear, a crucial task in such a remote region. We saw army workers operating bulldozers under the ever-present threat of being buried by further landslides. On the return journey from Badrinath, We was amazed to see that the road, although not completely repaired, was fully passable. All along the trip to Badrinath, the Alakananda river flowing below in a deep gorge kept me company. It was one of the most scenic stretches of our trip, and we regretted taking the bus, which left me with little time to appreciate nature's bounties. Finally we reached Badrinath, which as the starting point of many Hindu pilgrimages is a very modern town. With its bustling shops and restaurants, Badrinath was a bit of a shock compared to the previous few days. In Badrinath, We was disappointed to see that Neelkantha, the 6600-meter peak behind Badrinath, was invisible underneath a heavy cloud layer. The local people told us that it would probably be visible at dawn the next morning. Nothing could have prepared me for the spectacle I was to witness that day. We got out of bed at around four in the morning. It was a full moon night and, apart from the soft light of moonlight peeking from behind the still rather heavy cloud cover, everything was dark. Neelkantha was still invisible. My companions and we were all sipping hot mugs of tea and trying to protect ourselves from the cold mountain air when suddenly the clouds parted and out peeked the visage of Neelkantha gleaming like silver in the light of the moon. About 25 minutes later, the clouds came back to hide Neelkantha again. We were quite ready to go back inside when suddenly Neelkantha came back into view, except this time it was completely glimmering in gold. The sun had come up at that altitude, though the valley was still shrouded in darkness. Finally after a light breakfast we headed for Mana, the last Indian village before the mountains that form the natural border between India and China. My plan was to keep following the Alakananda, which by now had become a fraction of what it was at Devaprayag, to the Vasudhara Falls. This trek beyond Mana is not very popular, yet it is exquisite. You must cross glacial moraines and even a couple of glaciers before you can even see the 145-meter Vasudhara Falls. we was lucky to have a bright sunny day, and you could see whole ranges of snow-clad peaks in their pristine glory. This region is very prominent in Hindu mythology as the road the Pandavas, whose story is recounted in the sacred Bhagavad-Gita, were supposed to have taken on their way to heaven. Then, as suddenly as it had begun, it seemed, my trek was finally over. The day after we returned to the Dehra Dun in the foothills, torrential rains started in the mountains. These led to landslides which came to be known as the Great Himalayan Landslide of 1998. 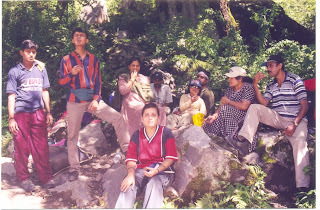 Over 80 people were killed in Rudraprayag and another 200 in Malpa Village en route to Kailash. The Himalayas are, like many great gods of old, as merciless as they are majestic. We started at daybreak to trek to the Valley of Flowers around five kilometers away. The valley was not on the pilgrimage route, and, since we had started much earlier than the rest of my companions, we found myself completely alone among the majestic mountains. After walking about four kilometers, we descended down into the glacier-covered landscape. As a protected National Park, there are no villages in the valley, and neighboring villagers aren't allowed to graze their cattle here. Nothing could detract from the sublime beauty of the Valley of Flowers. As we sat among plants five or six feet tall and listened to the silence, I experienced a kind of ecstasy that city dwellers don't get to appreciate. The bountiful wild flowers were spread out like carpets, their myriad intoxicating smells casting a spell difficult to ward off. It wasn't until the rains started in the afternoon that we was snapped out of my reverie and forced to start my return journey. The next day we reached the maximum elevation we would see on my trek, an altitude of 4329 meters by the sacred site of Hemkund Saheb. A glacial lake surrounded by seven snow-clad peaks, the Hemkund Saheb occupies a prominent place in Sikh and Hindu mythology. It took me about six hours to complete the steep six kilometer ascent that took us up a whopping 1281 vertical meters. Oxygen deprivation made the last few kilometers extremely daunting. It was humbling to see aged Garhwalis literally running up the mountains while I suffered with every step. Redeeming the entire experience was the exquisite scenery spread out before me, with the clouds constantly playing games and changing the whole landscape every few minutes. You could stand for hours appreciating the visual feast as one peak comes into view only to be covered by clouds which reveal another peak in turn. It was the ultimate natural slide show. The vegetation had also changed remarkably. When we started at Ghangria, there was considerable tree cover, which gradually thinned to a few shrubs and bushes at the top. The last half-kilometer of the trail is home to the elusive Brahmo Komol. This flower, perhaps the only Komol (lotus) to grow on land, features prominently in Hindu scriptures and grows in the wild only in high altitudes. As would become my usual routine, we started after a light breakfast at dawn. My backpack on my back, we was ready to conquer the world—that is, until the first landslide. It seemed as if the whole mountainside had moved down, squashing my bravado along with everything else that any person dared to put in its path. We made my way across gingerly, constantly looking up to see if more rocks were on their way down. It was a good nine kilometer stretch before We was out of landslide country and at my next stop, Helong. From here,we would take a bus to Govindghat (actually traveling on the roof of the crowded bus)and then walk another 14 kilometers before crashing that night. Under normal circumstances, traveling by bus to Govindghat is a simple proposition. During the monsoons, however, everything is unpredictable. As one villager put it, "You can go as far as the mountains want you to go." Though you should definitely be prepared for small medical emergencies and carry a good first aid kit, the villagers in the Garhwal region are known to be very friendly and helpful. In case of serious emergencies, the Indian Air Force has been known to airlift people to nearby hospitals. 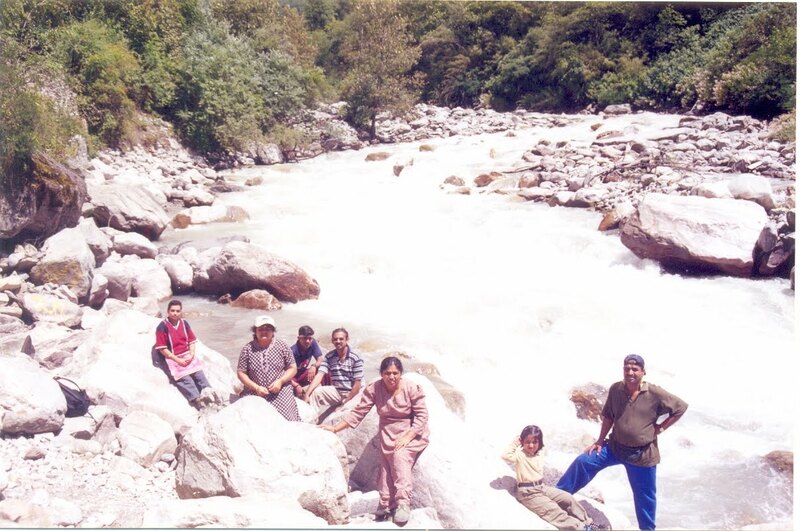 From Govindghat, we planned to travel to the relatively remote village of Ghangria. This would serve as base camp for trips into the Valley of Flowers and the Hemkund Sahib. 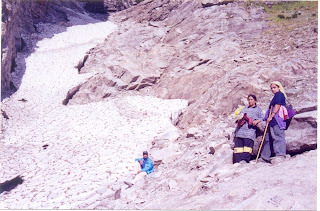 The route from Govindghat (at 1828 meters) to Ghangria (at 3048 meters) was well-worn by several centuries of pilgrims traveling to Hemkund Saheb. Many villages lay along the way as a consequence, places where we could buy food and water. we could have rented horses to take us down the trail, but we didn't want to sacrifice the freedom to stand on my own two feet and appreciate the grandeur of the Himalayas. Horse droppings combined with drizzling rain made the path slippery and treacherous; it was dark before we could see the lights of Ghangria in the distance. En route, a number of friendly Garhwalis led me through short-cuts in the dark. we wasn't sure we could have made it there without them. DON'T litter the surroundings with the waste papers, empty packets of the cigarettes, cigarette-butts, wrappers of toffees, biscuits, etc. Throw them only in the garbage-pits, the prescribed places. DON'T lit candles in the tents. It sometimes be a cause of fire. DON'T make noise during the night. It causes disturbance to others. DON'T pollute the water-streams and the rivers as the water from the same source are used by the people downstream for their daily use. DON'T walk over the crops and don't mutilate the plants and trees. This way, you might be ruining the earning opportunity of the locals. NEVER spoil the local monuments, caves, places of religious sentiments. Honour the local social customs & systems. KILL NOTHING, BUT TIMES & YOUR DULLNESS." BEFORE leaving the camps for your next destination, clean the surroundings for the coming team. Always try to leave them cleaner than the position you had arrived into. Like to see more photos of this trip Old Memory. Very nice details of the trip.